Mommy's Wish List: Lowe's: Kids, build a Madagascar 3 Plane toy. 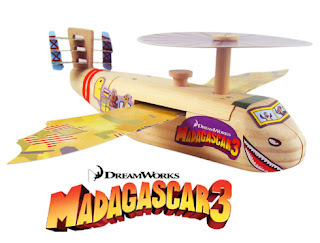 Lowe's: Kids, build a Madagascar 3 Plane toy. You are the craftiest little 5-yr-old boy I know, so I KNOW you would love to go make this Madagascar 3 Monkey-Powered Airplane at Lowe's on Saturday. The free kids craft at Lowe's will help keep you from burning the house down this weekend while mommy escapes on a mini vacation by herself. And, you can make all by yourself (with a little help from daddy) with your favorite tool: The Hammer of Thor! Remember, this is an outside toy. I expect to see all the ceiling fans still attached to the ceiling when I come home on Sunday. Tell daddy to register you here. Then, please go to Lowe's promptly at 10:00am on Saturday, June 9th (Preferably for as long as possible) Bring daddy. Since you can't drive and all. Maybe you can swing by Jack in the Box and get brother 2 crunchy tacos and an egg roll, cuz you know he won't be up that early. Subscribe to Mommy's Wish List so you don't miss a fun thing for your husband to do with your kids so you can be left alone in peace on a Saturday morning.